For as long as I can remember I’ve owned a Weber Smokey Joe grill. I bought my first one about 20 years ago and just last year I had to replace it. The connection where the legs attached to the bottom kettle bowl simply rusted out over time. I tried to extend its life as long as I could but I bit the bullet and bought a new Weber Smokey Joe Silver just a few months ago. Believe it or not, the top and bottom kettle bowls of the old one were still in excellent shape but it was time to invest in the latest and greatest Smokey Joe. For my barbecue and grilling fun I now own both a new Weber One Touch Silver kettle grill and a new Weber Smokey Joe Silver charcoal grill. So why do I own two different brands of Weber? Oftentimes I just grill for family and the Smokey Joe is the perfect size for the four of us. It is even big enough for a couple more guests should we have them over. The Smokey Joe Weber grill allows me to be a little more conservative with the amount of charcoal that I use and it is just the right size when there isn’t a big crowd. When it comes to a party or having many guests over, I opt for the Weber One Touch Silver. Sometimes I actually fire up both of them at the same time depending on the crowd. As you can tell, I simply love the Weber charcoal grills. Their design is unprecedented and they cook so much more evenly than the copycat kettle-type grills that are out there. Another great advantage of a Smokey Joe is that it is portable when you need it to be. I have brought my Smokey Joe camping and to the beach on occasion. 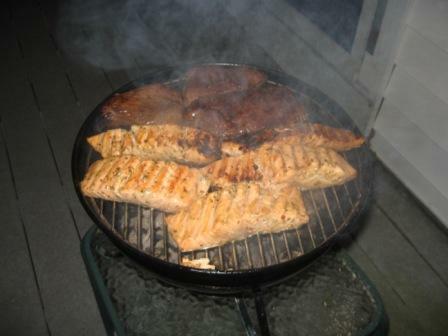 We oftentimes rent an oceanfront cabin and the Smokey Joe allows me to grill our favorite meats and seafood with a panoramic view of the Atlantic Ocean. Easy to assemble. Within 10 minutes you can have it fully assembled and ready for grilling! Portability is one of the greatest features for tailgating, cooking at the beach, and camping. 14.5” nickel-plated cooking grate is plenty big for your everyday grilling needs. The top and bottom bowls are porcelain-enamel limiting rust over the long haul. Nylon glass-reinforced handle is long-lasting and allows you to safely remove lid when hot. At 9.5 pounds it is easily moved from one location to another. Will last for years. I owned one for 20 years and the bowls never rusted out. Rust-resistant aluminum legs will last forever. Ash catcher for hot ashes is a convenient safety feature. 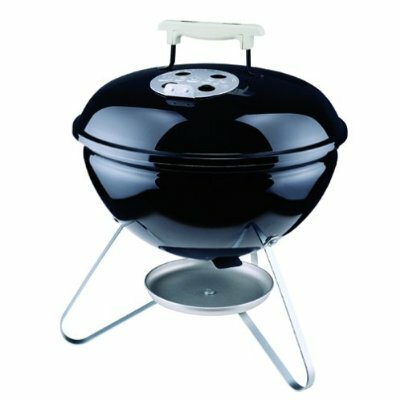 Buy a long-lasting Weber Smokey Joe for your everyday grilling needs! Weber is one of the best names in grilling. Their products are of the highest quality and, as a result, last for years. If you invest in an economical Weber Smokey Joe grill, you’ll experience what it’s like to grill with the best charcoal grill in the business – Weber. And if you love the Weber Smokey Joe Grill you might also want to invest in a Weber Smokey Joe Bag Grill Carrier. I recently bought one and I love it. This Weber Smokey Joe bag allows me to transport my Smokey Joe easily if I want to tailgate or simply head out to the beach for the day. This specialized carrier is specifically made for the Smokey Joe and it comes with the Weber name and quality. It also comes with a handy carrying pouch for your grill accessories. If you are crazy about charcoal grilling you should have both the Weber Smokey Joe grill and the Smokey Joe Bag. You will not be disappointed! Thanks for posting these articles…they are very helpful! Just one question…i plan on buying the one touch 22.5 in but i really only cook for myself for the time being. Do you think i will be able to cook just a few hamburgers or steaks without using too much charcoal on this model or should i opt for the smokey joe? I prefer the one touch as i only plan on buying one grill, but if it makes a big difference for just one or two people…i may reconsider. Thanks for your help! Thanks for dropping by and if you plan on only buying one grill, it may make sense to opt for the 22.5″ One Touch for a few reasons. It is big enough to cook for yourself or a group if you happen to have visitors. The One Touch also comes on wheels which is extremely convenient if you have to move it around your deck after the charcoal is hot. You can’t easily and safely move around the Smokey Joe after it has hot coals in it and sometimes you have reason to do so. You also only have to use as much charcoal as needed and don’t forget that you can always reuse old charcoal as long as it’s not wet. To be honest, I don’t even own the 22.5″ One Touch model yet but I really want to do a beer can chicken and the 18.5″ One Touch will not allow you to completely cover the chicken when it is sitting upright in the 18.5″ model. I am confident that you can do so with the 22.5″ model (already did the research) which is one of the reasons I’ve had my eye on picking one up. Home Depot has the cheaper version of the 22.5″ One Touch for $99 (same price on Amazon) and I think that is the one I’m going to buy. One thing that you might want to think about when it comes to your grill is whether or not you are planning on being able to bring it with you on vacation, tailgating,the beach, or away for the weekend. The Smokey Joe is awesome when it comes to portability and it would be difficult to bring a 22.5″ Weber One Touch with you unless you have an open bed truck. Actually I just measured the height of the 18.5″ One Touch with the grill cover on is right around 35″ and I measured the inside of the rear of my Honda CR-V SUV and it looks like it would just barely fit. I think the 22.5″ model is a bit taller so it probably wouldn’t fit. As I suspected, I just checked the height dimensions on Amazon and it says 38.5″ so it’s about 3″ taller than the 18.5″ model. It’s all about what you are looking for Stephen and your own individual criteria. If you are looking for a great grill that gives you portability and affordability, the Smokey Joe is the way to go. If you are looking for a more functional grill that you probably won’t be bringing it with you when you travel, the Weber One Touch (22.5″ model is probably preferable) should be your choice. That’s why I have both the 18.5″ One Touch and the Smokey Joe and, honestly, I’ll be buying the 22.5″ One Touch for the reasons I already mentioned. Good luck in your purchase! Hi! What is the mat that you have under the Smokey Joe in the picture? I’m looking for something similar that isn’t too big, but rather fits the Smokey Joe dimensions without taking up extra space. Thanks for your question. Actually, in that picture I have it on a small glass table and there is no mat under it. 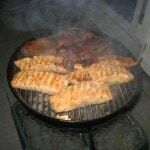 I think if you look in this article on my site and scroll down to the grill pads, the circular one called The Original Grill Pad, Round it may be the best option for a Smokey Joe. It is 30″ in diameter. I just pulled my Smokey Joe out and if you bought this particular grill pad it would have about an 8″ clearance all the way around the Smokey Joe which I feel is about the right amount to catch any spills etc. Just take out a tape measure and place it under your Smokey Joe and put it in the middle of the 30″ and you’ll see what I mean. Thanks a lot for your question and good luck! I love my Weber Smokey Joe and I use the grill mat I wrote about in this article for all of my grills but it’s a bit large for a Smokey Joe but I don’t care that much about that because I just roll it up after I use it and keep it in the corner of my deck.